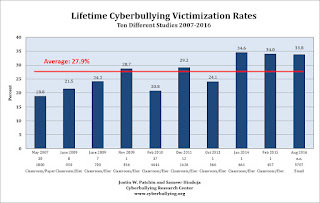 According to Cyberbullying Research Center, the National Crime Victimization Survey (NCVS) is a large-scale data collection effort led by the U.S. Census Bureau and the Bureau of Justice Statistics. This study has been going on since 1973. In 1989 they added supplemental questions focused on school-related incidents, and stepped this up to a more in-depth biennial survey in 2005. Cyberbullying is still a major issue. It's been over 4 years since I've written on this subject. While there is perhaps more visibility, the basic problems haven't changed. 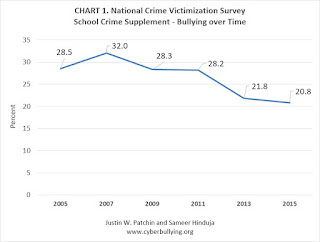 Based on the above benchmark, at first glance, bullying appears to be trending down over the past decade. While there have been some high-profile cases over the years, this is a real, current and ongoing issue. The problem with the US Census figures is that they don't line up with other studies. 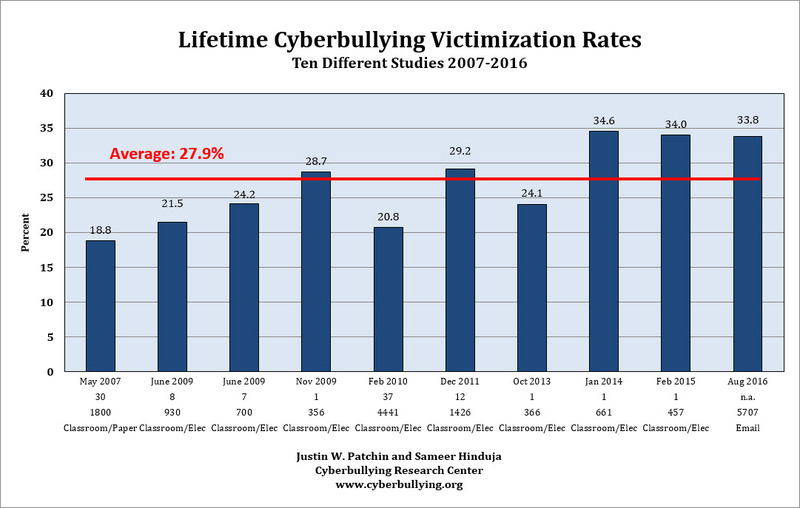 For example, this data from the Cyberbullying Research Center tells a different story. There is a need to get useful and accurate data on this for 2 reasons: to quantify the issue to know how prevalent it is so that resources will be put to solutions, and; so that victims know that they aren't alone. Good data will help understand which solutions work, and how well. Keep a safe and open environment for your kids. Make sure they know that they can come to you to talk about any issues. Make sure that your kids know it is not ok to participate in any kind of bullying. Learn about your kid's technology - sometimes that's easier said than done. Check with your school about their technology and social media policies. Finally, here's a video from Stop Cyber Bullying website. It's part of the website, so go there and check it out. It's very powerful. Great post. As both a security pro and a commercial daycare center owner this subject is something I need to put more thought into. My center provides 3rd Party gym, language, music, and technology teachers to our little ones. Maybe this is a good time to introduce some sort of "ethics" training for pre-K students. I'll run it by my director! Thanks Barry!